The Never Ride Alone Program - Don't leave home without it! The Never Ride Alone Program from Intercon Messaging - normally a $65 call is FREE to registered members of RiderFriendly.com - you call them, tell them where you are going, what you ride and your contact info and then check in with the service during fuel stops - and should you not make it to your next or final stop within 15 - 30 minutes of the estimated time of your arrival (Time will be set between you and your operator) - the service will start attempting to contact you at the numbers you provided - if after two attempts they are not successful in raising you - 911 services are dispatched to go find you from your last check in point. For areas where cell phones don't function well, or GPS and cell is damaged in a crash, this service could save your life. This service is available in Canada and the Continental USA. 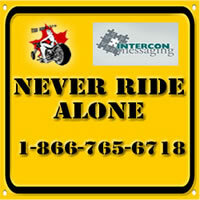 The Never Ride Alone Support Centre from Intercon Messaging is a toll free service that allows regietered members of RiderFriendly.com to access the Never Ride Alone Program.